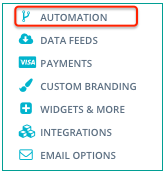 Triggers, or Automations, are a key benefit of Tokeet. A trigger is an instruction to Tokeet to perform a particular action when an event occurs. 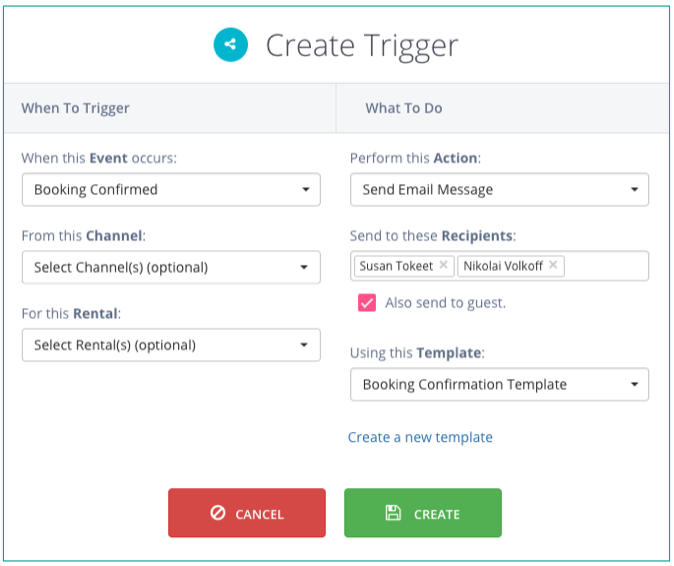 For example, triggers can be used to notify you and your guests via email or SMS when a new booking is received. Tokeet currently does not automatically send email when events occur, so we recommend setting up triggers in order to receive account notifications. Before creating a trigger, you need to build a Message Template. Triggers require message templates to work. Triggers are extremely powerful, and are easy to create in Tokeet. Click "Create" to build a new trigger. Guest Created: Guest is created either via the dashboard, from a Tokeet website or widget, or from a channel connection. Guest Updated: Guest is updated via the dashboard or a channel connection. Guest Deleted: Guest is deleted from the dashboard. Inquiry Created: Inquiry is created via the dashboard, a Tokeet website or widget, or an API channel connection. Time-based events: specify an action that occurs at a particular time around another event. Learn more about time-based triggers here. Channel Disabled: inform your internal team that a channel connection is disabled, and that action needs to be taken by your team in Tokeet. Your new trigger is now created! You are returned to the Triggers-Message Automation Screen. Here, you can use filters to search among existing triggers, edit and delete triggers, or toggle the status of each trigger between "Active" and "Paused."